It's your student/faculty/staff ID card The ISUCard carries your university ID number and photo. Your university ID number is not the same as your social security number, though some university departments may request your social security number. The ISUCard verifies your status as an ISU student, faculty or staff member and provides access to university services and facilities, such as AccessPlus and the Lied Recreation/Athletic Facility. The ISUCard is your passport to ISU Library services. You have enough to worry about in college without having to stress out about your finances. U.S. Bank makes it simple. Open an optional U.S. Bank checking account with great student benefits and turn your ISUCard into your Campus ID and ATM/Debit Card -- all in one. We've made it easy for you to manage your money with a great checking account for students. Learn more about U.S. Bank! Lighten the load a little with U.S. Bank. Access your U.S. Bank Checking account by using your ISUCard as your U.S. Bank ATM and PIN-based debit card. Plus, use your ISUCard anywhere PIN debit is accepted at participating merchants. Whether you're at the gas pump or the grocery store, simply swipe your card through the reader, select "debit," and enter your ATM PIN code. After you approve the amount to be paid, the total will be debited from your checking account. Check with your favorite local retailers to find out if they accept PIN debit. Cardholders can activate their CyCash account through AccessPlus by depositing up to a total of $50. This can be done by charging their University Bill or by direct debit from a checking/savings account. 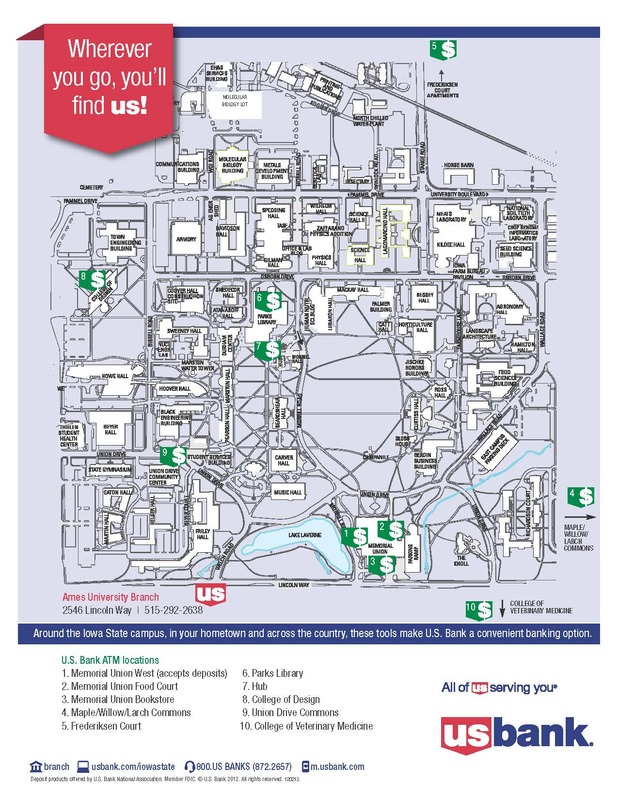 By activating the CyCash account, your ISUCard acts just like money and can be used at a variety of on-campus locations, such as the Vending Machines, Memorial Union Food Court, University Book Store, Department of Residence C-Stores, Laundry Facilities, Dining Facilities, and Copiers. Your ISUCard services will only continue to grow. The security of your ISUCard is important. You should report the loss of your ISUCard immediately in AccessPlus under ISU ID's or to the ISUCard Office, (515) 294-2727. Unauthorized use of your ISUCard could result in some liability. There is a $25 fee to replace your ISUCard. If you have questions about the ISUCard or want to find out how to receive your ISUCard and begin enjoying its convenience and versatility, contact the ISUCard Office at (515) 294-2727.